Bigot Gate, Does Gordon Brown Despise Labour Voters In Private? UK General Election Tipping Point Against Labour - After an 10 minute exchange with a Gillian Duffy a 66 year old life long Labour voter concerning issues such as the National Debt and Immigration, Gordon Brown when getting into his car left his radio microphone on and referred to the Labour voter as a bigot. 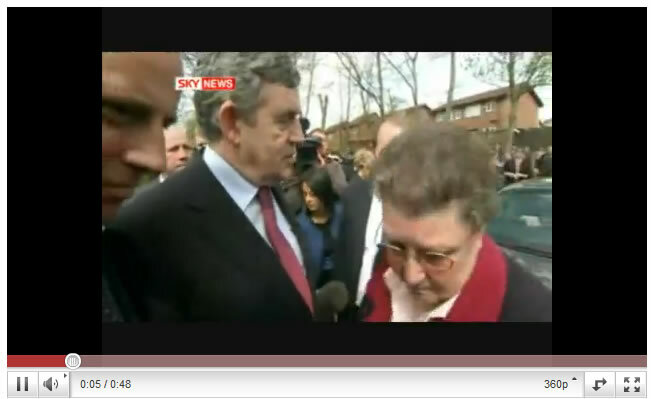 Gordon Brown: That was a disaster...should never have put me with that woman. Whose idea was that? Justin Forsyth: I don't know, I didn't see her. Justin Forsyth: Not sure that they'll go with that one. Gordon Brown: They will go with that one [Predicting the media will run footage of the encounter]. Justin Forsyth: What did she say? The whole exchange is expected to slice another point or two from Labours already poor poll rating, now there is a strong probability that Labour will come third in the General Election in terms of percentage share of the vote.